I still blame AOL for burying me in these in the late 1990s. So this week we discovered AOL still exists. Great! Good for them. My memories of AOL are deliberately cloudy. My parents used them as their main way of accessing the internet throughout most of the dial-up era, which meant I spent an awful lot of time listening to modem sounds and swearing. I also had about three dozen AOL IM accounts, as did everyone else I knew. Other than that? 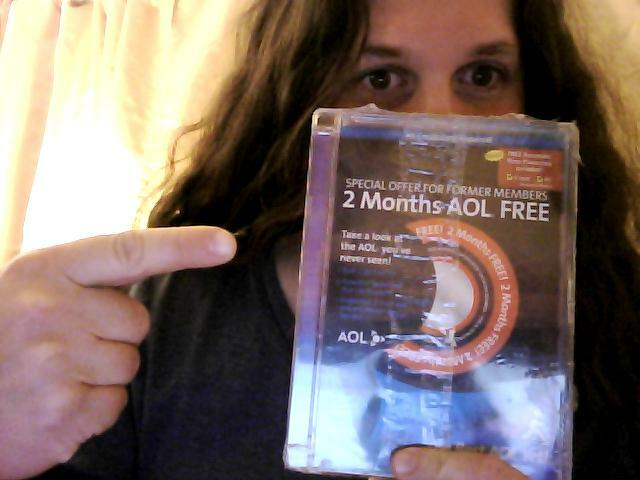 My major memory of AOL is the “Try AOL for free! We’re Desperate!” CDs they were thoughtful enough to send me. We actually signed up for AOL briefly using one of the free CDs, but only to get access to the Web for long enough to find a better ISP. The one I’m holding above is still in the original plastic wrap. They put an ID# and password on the back of the package. The password is “HERMIT-EXAM”, which makes me wonder what a hermit exam would be like. Would there be essay questions on what kinds of caves are nicest? Multiple choice asking how many people it was acceptable for hermits to live with? Hermits may or may not connect to the internet, I suppose. AOL’s acquisition of the Huffington Post seems like a weird fusion of the old and new internet, though AOL is actually a lot more cutting-edge than I thought. There’s lots of speculation about what it all means, and how our entire world of news and internet will somehow be different. Wow! But for some reason, I doubt it. 6 Responses to "You’ve Got Link Bait"
The New Yorker just did a piece about the former Google Dude-le who took over there. The full text isn’t up- abstract at http://www.newyorker.com/reporting/2011/01/24/110124fa_fact_auletta- but it brought back a lot of memories which are probably going to turn into a blog post of some sort. I just hope this HP thing doesn’t turn into another of their massive missteps of the past decade- probably the worst being the one nobody really heard of, because it was so horrid (buying the Not Facebook But We Play It On The Internet network named Bebo and wrecking their whole established profile system to try to merge it). AOL, sadly, isn’t all that good at keeping the properties it buys afloat. I promised you’d inspire a blog entry, and look! You did! Most of the AOL mailings I received were 3.5″ floppy diskettes. The best password I knew of was “OWNERS-INANE.” A photo of that one ran in PC Magazine’s back page. We immediately switched from AOL to NetZero, or whatever it was calling itself at the time. We had them for many years before switching to DSL. And I love that password!